This post was previously published at MaisonCupcake.com. Now Christmas is over I’m starting to think about summer holidays – there is an offer at the bottom of this post for 10% of French holidays with Siblu. 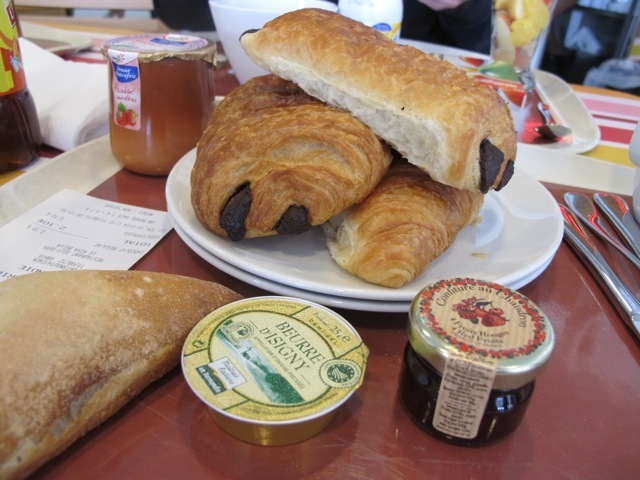 We could have gone for Le Full English but with another meal time due before the end of the crossing, bread and pastries were the order of the morning during our Brittany Ferries journey from Portsmouth to Caen. Our family are seasoned travellers across the channel, we’ve done nearly every route and transportation means but Brittany Ferries’ longer mid channel crossings are our favourites. Previously we’ve traversed overnight, sleeping in cabins and arriving at St Malo the next morning. For this trip we had slept in a curious hotel outside Portsmouth and boarded “Normandie” before 8am. We were en route to St Brevin les Pins, for our trip with Siblu holiday parcs. After the six hour crossing we had a further 3-4 hours to get to our mobile home accommodation. You might think cabins are just for sleeping in but I swear by booking one during the day. They’re half the price they would be for overnight crossings and having somewhere to put your bags down with private bathroom is invaluable. We didn’t spend much time in ours on the way there although my dad had a 2 hour snooze on the way home. St Malo crossing cabins include a television although for Caen crossings the basic cabins only have radios. Never mind, on this occasion we at least had a window. There’s an entertainment schedule pinned up on a board, during the daytime crossings it’s mostly focussed at kids with someone dressed up in a bear costume, clowns making animals out of balloons, that type of thing. The best thing about Brittany Ferries for kids is the soft play area and drawing tables. Ted drew this fabulous picture of the boat. In the restaurant kids get gift boxes with plastic toys supposedly to pass the time – although amusingly they’re generally unsuitable for use in a confined space i.e. plastic dart board, water pistols. Restaurant options onboard include a snack bar selling pizza and sandwiches, a self service restaurant with hot meals and salads. There’s also a more upmarket buffet restaurant with table service although we’ve not tried that out yet as it’s over 25 euros at head and frankly the food is good enough in the self service one that I don’t see the point in paying this much. The length of the crossing gives you a chance to relax and genuinely makes the journey part of the holiday. The time passes very quickly and you cut down on a lot of driving. Customer service onboard is excellent with friendly staff in the resturants and shops (mostly French). Both sterling and euros are accepted onboard however sterling works out significantly cheaper. Best of all, when you get off at the other end, you don’t need to hire a car! We travelled as guests of Siblu holiday parcs and Brittany Ferries. Read my review of Siblu Les Pierres Couchees here.